Since the introduction from Hornady in 2008, the 6.5 Creedmoor has been a popular competitive shooting cartridge, and is rapidly gaining a high amount of respect in the hunting world. But why? According to Hornady, the 6.5 CM was the first-ever production cartridge developed – by Dave Emary and Dennis DeMille in 2007 – from the ground up, intended to give competitive shooters a factory-loaded cartridge to compete at the highest level. Hornady also states the design was loosely based on the .308 Winchester. Other information sources say the 6.5 CM was based off the 30 TC cartridge. Whichever is true, however it was coined, doesn’t really matter; the 6.5 Creedmoor cartridge is one impressive round. And with much success earned in shooting competitions, it was only a matter of time for hunters to discover its many benefits. I picked the brain of firearm-industry icon Michael Bane for his thoughts about how the 6.5 CM climbed in popularity. “The high-ballistic coefficients of a lot of 6.5mm bullets make them excellent for long-range cartridges,” said Bane, host of Shooting Gallery on Outdoor Channel. Which would explain one reason why the 6.5 CM has been so popular with competitive shooters. However, “popular” can be a relative term. To get one prospective of exactly how popular the cartridge is with custom-built rifles, I quizzed Mark Gordon, owner of Short Action Customs based out of Wellington, Ohio. “The 6.5 Creedmoor is the most popular 6.5mm (cartridge) that we chamber up,” Gordon said. “In fact, it is the most popular caliber we chamber, period! But there must be other reasons; there are other 6.5mm cartridges out there sharing the same bullets. For the seasoned white-tailed deer hunter with several tally marks scratched out on their trusted .308 or .243 wood stock, more valid reasons to give it a try are likely required. Mark Gordon agrees with Bane’s assessment, and noted a few other advantages. “Shooters enjoy the lighter recoil (of the 6.5 CM) when compared to the .308 Winchester,” Gordon said. “The 6.5mm bullets are extremely accurate and have more energy at 300, 500, 800 and 1000 yards (down range). Hmm. Heads up for you hunters; now we’re getting somewhere. “Given the success, especially in Europe, of 6.5mm chamberings, there were already lots of hunting bullets around in the 120- to 140-grain range, so it was just a matter of time,” said Bane, also a co-host of The Best Defense on Outdoor Channel. Enough with the history lesson. What can this cartridge really do – performance wise – in the hunting world? I often don’t like to give recommendations to hunters looking to hunt the biggest game with the smallest cartridge possible. You never really know how good of a shooter you’re dealing with. Whether shooting a bow at a white-tailed buck, a .22 LR at a fox squirrel, 7-shot at clays, or a .338 Lapua Mag at an empty beer can 1,000 yards away, shot placement is everything. Unless, of course, we’re talking about hand grenades and Rambo-style exploding broadheads. For what I call medium-size game, such as whitetail, antelope, mule deer, wild hogs, go get'em with the 6.5 CM; it will do the job and do it with great efficiency. And for you song-dog coyote callers that like the challenge of long-range open-country hunting, give this cartridge a serious look. Mike Stroff, host of Savage Outdoors on Sportsman Channel, agrees with that statement. 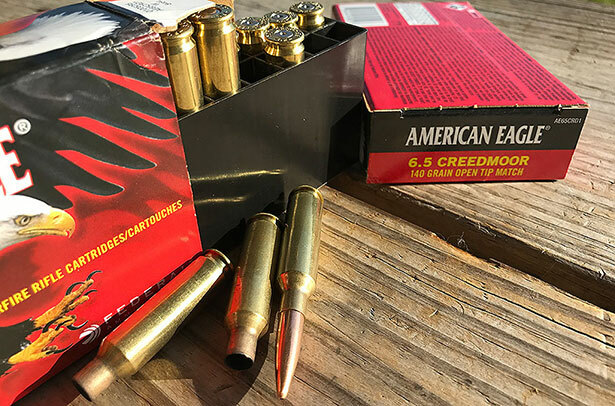 Now let’s look at and review the real purpose I’m writing and you’re reading – guns, suppressors, ammo and scopes – anything and everything related to the epic 6.5 Creedmoor cartridge. Since its debut, approaching 10 years ago, the 6.5 Creedmoor has become a very popular hunting cartridge – due to flat-shooting ballistics and lower recoil – on the market. To help meet consumer demand, Savage Arms has added several new rifles chambered for the hot, flat-shooting cartridge. Models include the 16 Lightweight Hunter, AXIS, AXIS XP and AXIS XP II. Among these models are right and left hand, blued or stainless and camo options for a total of nine different – new – configurations. In total, they offer 18-ish rifle options for people with 6.5 Creedmoor-itis. Obviously, Savage has taken the time to make sure there’s a 6.5 Creedmoor rifle option for just about anyone. Editor’s Note: Actually, there are 19, but one has yet to show up on their website. More about this “ghost” rifle below. I own the Savage Model 12 Long Range Precision rifle. Without going into detail, let’s just say it can shoot way better than I can. The American Rifle series has been a solid addition to Ruger’s already-vast offering. With the price-conscience gun enthusiasts in mind, the American series come loaded with many bells and whistles at a competitive price. User adjustable trigger from 3 to 5 pounds of pull; barrel-free-float stock; threaded barrel; one-piece scope rail; sling swivel studs and a removable rotary magazine; all with advertised MOA accuracy. And, you can own one of these featured-packed rifles – American Rifle Predator – in 6.5 Creedmoor. And if all of those benefits don’t already have you budgeting for another rifle purchase, then maybe this statement from Michael Bane will have you checking the bank account balance. It’s a strong statement in a competitive market for hunters looking to improve their effective shooting range without having to break into the kiddo’s college fund. In addition, Ruger currently offers 6.5 CM in three more rifle configurations in the Hawkeye lineup. Add in the Precision Rifle, which I will talk about below, there are five options for Ruger fans to choose from. AR fans, don’t feel left out; there are a few options for you as well. Though not as widely available as bolt-action rifles, some AR brands are building AR-10s in 6.5 CM. It appears most people are going the custom-build route, and there are plenty of small shops out there more than willing to build whatever you want. Just type “AR-10 Custom Builders 6.5 Creedmoor” in Google and you’ll find all the information needed to begin your quest. Without going the custom route, DPMS Panther Arms does offer an AR-10 chambered for the wicked 6.5 Creedmoor. Listed under their competition rifles section, the LR-65 is a spinoff of the popular LR-308. Weighing in at 11.25 pounds and sporting a 24-inch stainless bull barrel with a 1-in-8.5 twist rate, this beast would likely make both precision shooters and hunters perfectly happy. Seekins Precision is now offering their SP10-6.5 (6.5 Creedmoor) to the public. Best I can tell from the price listed on their website, this semi-auto sort of fits between factory-production and custom-built AR-10s. They tout the best features and components on the market today, and designed for shooters, by shooters. The SP10-6.5 is currently listed as “backorder,” which seems to be the norm with any 6.5 CM rifle. Ok, so I don’t really know how to title this section. It’s a bird, it’s a plane, nope; it’s Superman. The same can be applied here. From a distance, I’d argue with a brick wall that the rifle on the shooting bench is an AR-style weapon. Launched in 2015, Ruger calls their hybrid version the Precision Rifle. Offered in three different cartridges, including the 6.5 Creedmoor, the Ruger Precision Rifle has a little bit to offer all types of shooters. The rifle comes stock with many feature-rich benefits, such as a threaded 24-inch chrome-moly steel 5R rifling barrel; 20 MOA picatinny rail; over-size bolt handle and 2.25- to 5-pound adjustable trigger, just to name a few. I didn’t shoot it at 1,600 yards but did get to crack off five rounds at bowling-ball pins at a 100. Just the feel of the gun and crisp trigger makes it 10.6 pounds of awesome. Shortly after the 2016 SHOT Show, there wasn’t a lot of information to be found about this new expansion of Savage’s 10/110 BA line. I’ll let you guess what “BA” stands for. Since then, the Savage Model 10 BA Stealth has hit the production line and released to gun dealers for sale to the public. The Model 10 BA Stealth was developed to be a lighter, more compact option to the original Model 10 BA offering, along with a bit better price tag. 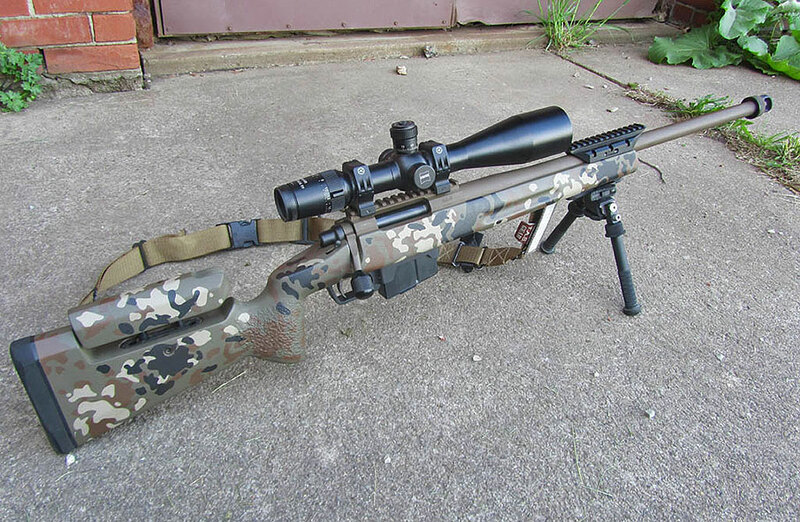 The rifle is essentially a factory-blueprinted Model 10-barreled action married to a custom version of the Drake Hunter/Stalker monolithic aluminum chassis – modified to Savage’s specifications. It comes nicely equipped with a 5/8x24 threaded muzzle, EGW scope rail, Fab Defense GLR-SHOCK six-position buttstock with adjustable cheek piece, 10-round capacity and the adjustable AccuTrigger. Chamberings? The tried-and-true .308 Winchester and, of course, the 6.5 Creedmoor. The 6.5 Creedmoor version – my personal favorite – has a 24-inch, 1:8 rate-of-twist barrel and weighs just more than nine pounds. The .308 Winchester is a bit shorter with a 20-inch, 1:10 rate-of-twist barrel. I’ve personally fired a significant amount of ammunition through a 6.5 Creedmoor version. Simply put, it’s a well-built, tack-driving machine. Earlier in this article, there was much mentioned about competitive shooting, the birth place of the 6.5 Creedmoor. Where were these competitive shooters getting their rifles, and where are they getting them now? Simple; by contacting a custom rifle shop, such as the one Mark Gordon owns, Short Action Customs. According to Gordon, going through the process of getting a custom rifle built, and owning one, isn’t for everyone. The vast majority of hunters and plinkers looking to cash in on the benefits of the 6.5 Creedmoor will be perfectly happy with a factory build, like the brands and models noted above. “With time, the shooter will demand more accuracy, more consistency out of the rifle, along with more features, such as a detachable box magazine, a larger bolt knob to manipulate the bolt faster, and a stock that fits them more comfortably. “Once the shooter has been bitten by the ‘accuracy bug’ and wants more features, they turn to companies like us to help with a custom build,” Gordon added. With growing interest in a custom-built rifle, I pressed on with the following: But there are a few factory-production rifles already offering some of those features. 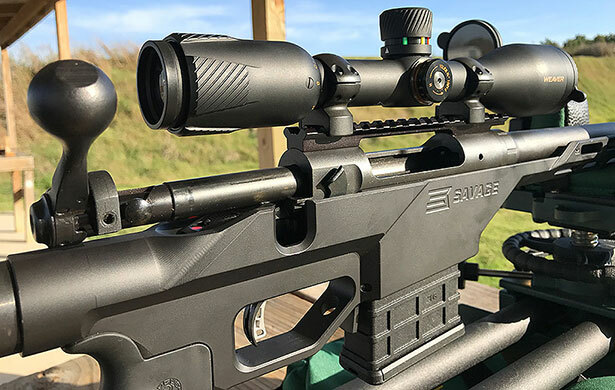 “New products intended for precision shooters, such as the Ruger Precision Rifle (noted above) are starting to bridge the gap between a traditional production rifle and a custom-built rifle,” Gordon said. And that’s not a bash at all on the factory-production brands. It’s about specific needs and preferences. You may be diehard fan of some feature – stainless steel, precision stock, low trigger-pull weight – and maybe none of the factory-run rifles are a fit. For specific needs, demands for ultimate precision and accuracy, and the want for a one-of-a-kind personalized bullet slinger, custom builds are the way to go. Assuming, of course, you’re willing to spend some cash. Custom builds aren’t cheap, but maybe not as bad as you might think. After talking with Gordon about the process, “custom” also comes with “flexibility.” Flexibility in the sense not all the required parts to build the rifle have to come from the custom shop. Ammunition makers have jumped on board in a significate way, which is good news for 6.5 CM fans. Unless you’re a reloader, there aren’t many things worse in the shooting world than making a rifle investment chambered for a cartridge not easily found for purchase. 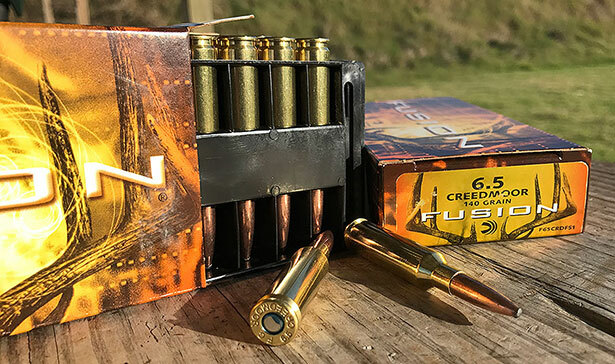 It was destined to happen – and it did – the popular hunting ammunition brand Fusion offers a 140-grain option for deer hunters looking to take advantage of the brand’s touted large expansion and high-weight retention. The advantages of the skived bullet tip and boat-tail design should yield plenty of smiles for long-range hunters. Touted for quality control and precision craftsmanship above all else, DoubleTap Ammunition is catering to long-range hunters with their DT Longrange line. There’s the lead-free 127-grain Barnes LRX-tipped, and the 140-grain Nosler Accubond to fill the needs of most hunters seeking mid-size game, including those pesky wild hogs. Shooters looking to spend some time at the range with their 6.5 CM rifles may want to give American Eagle a look. The brand offers a 140-grain open-tip match round perfect for accurate, higher-volume shooting. For additional 6.5 CM hunting-round options, or for those seeking match-grade ammo, just pull up MidwayUSA; there are several brands – American Eagle, Hornady, Fusion, Winchester, Nosler – and bullet weights to choose from. There is truly a 6.5 Creedmoor movement, or craze, happening with all shooting disciplines. From factory-run rifles to custom builds, from silencers to ammunition, everyone in the industry seems to be on board. At least for the moment. Is the 6.5 Creedmoor just the latest flavor? 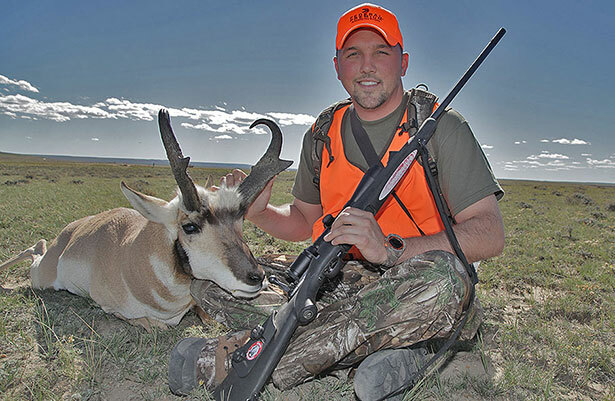 Is it here to stay and become a household name like the .308 Winchester? Mike Stroff offered a few opinions.